If you’re a foam lover, then we have a good mattress comparison for you today. Tempurpedic is known as being your quintessential luxury memory foam mattress. It’s been one of the largest players in the mattress industry for quite some time and doesn’t seem to be slowing down anytime soon. The company focuses on providing a classic memory foam feel while never compromising on luxurious materials and design. That said, Tempurpedic is not the only luxury choice available for sleepers. Aireloom is right up there when it comes to quality and luxury. Aireloom will stop at nothing to provide its sleepers the best materials and manufacturing techniques, focusing on handmade design and top-tier foams, silks, and cotton. Unlike Tempurpedic, Aireloom focuses on hybrid mattresses with innerspring cores and foam tops. 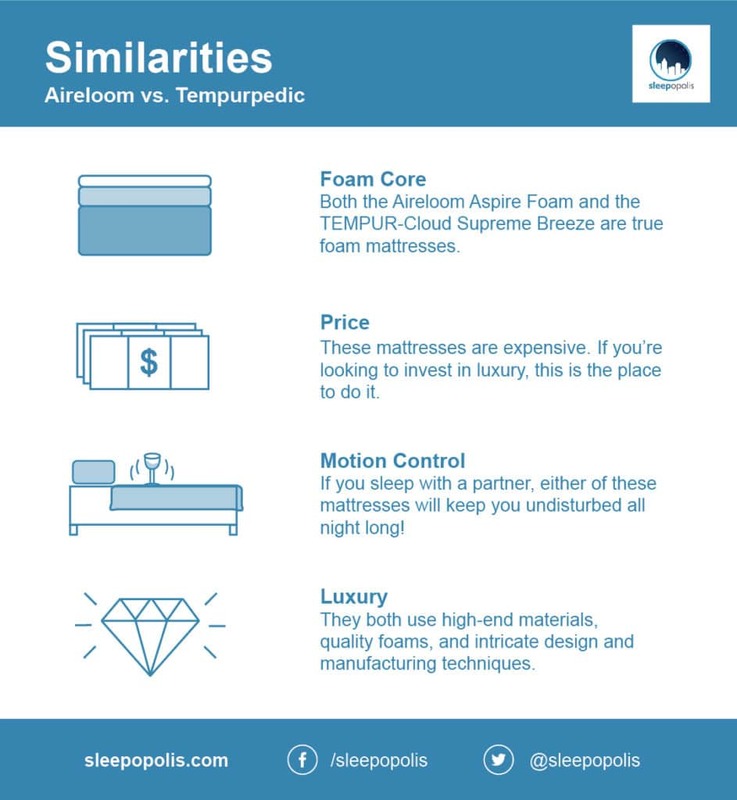 Continue reading where we’ll break all the Aireloom vs Tempurpedic details down, from construction to feel, price to sleep preference. Learn which mattress might better suit your needs and be a great fit for your personal sleeping needs. Aireloom is a luxury mattress brand based in California and owned by E.S. Kluft & Company. They have five different mattress collections and solely sell in retail stores across the US. In total, Aireloom currently offers 27 different mattresses, most of which are true hybrid mattresses that are entirely made by hand in the United States. 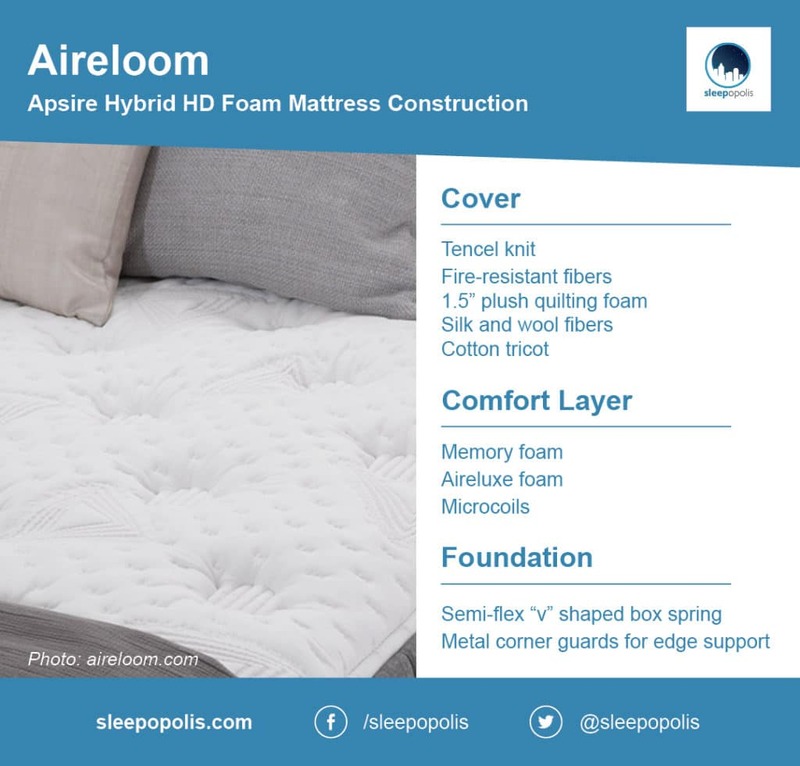 All Aireloom mattresses are constructed slightly differently, but most follow this template: plush foam in the quilt and comfort layer, followed by micro coils and an innerspring core. However, for this comparison, we’re going to look at Aireloom’s most unique mattress: the Aspire Hybrid HD Foam Support. This is the only mattress collection that has a foam core. The only springs you’ll see are the micro coils. The collection comes in three comfort levels: Plush, Luxury Firm, and Firm. Let’s dive into all the details! The surface material for the Aspire HD Foam starts with an ultra-conforming knit made with Tencel, a fabric made out of cellulose from eucalyptus trees (fun fact!). Tencel tends to be softer than cotton, and also more breathable — keeping you cool at night. The quilt also includes fire-resistant fibers and a 1.5-inch layer of plush quilting foam. The final touches include a layer of silk and wool fibers, followed by a knit cotton tricot. The comfort layers for the Aspire Hybrid HD foam will vary in thickness depending on if you choose the firm, luxury-firm (or, medium-firm) or plush comfort level. These mattresses consist of a top layer of memory foam, followed by airelux foam. The biggest differentiator between this mattress and the Tempurpedic one we’ll look at in a second is the micro coils at the bottom of this comfort layer. These micro coils are made from thin and flexible wire that provide an add an extra dose of pressure relief and comfort versus sleeping directly on your mattress core. As far as the core of this mattress, the Aspire HD Foam is comprised of — you guessed it — high-density foam. HD foam is typically super durable and will keep its firmness longer than lower density polyfoam, naturally creating a firm and supportive feel. The box spring is a Semi-Flex this foundation, which is constructed with a “V” shaped module and held in place with an interlocking grid work. This design provides a slight “flex” and is specifically made for mattresses that don’t need to be flipped. There are also metal corner guards for extra edge support. As we just described, the Aspire Hybrid HD Foam mattresses are mainly foam with a layer of micro coils in the comfort layer for a nice touch of sturdiness and resilience. The comfort layer, comprised of memory foam and Airelux foam, will mold around the contours of the body and provide slow bounce-back. Moreover, Aireloom’s patented Aireloom Lift™ aims to provide a weightless feeling while ensuring you feel like you’re sleeping “on top” of the mattress instead of sinking into it. In reality, it’s an air chamber that increases the areas of low pressure when you’re laying on the mattress. In addition, the Aireloom Aspire is known for its edge support, ability to isolate motion, and to cradle and “lift” your body with the Aireloom lift technology. Lastly, this bed will be breathable and soft. All mattresses in the Aspire Hybrid line use Tencel; the high absorbency of these fibers make the fabric smoother and cooler, while typically being more vibrant and less prone to fading over time. Make sure to go to a retail store to find out the exact cost of this mattress. There is no pricing information online, but we do know the original Aspire Collection, which inspired the Aspire Hybrid, had mattresses that were in the $1300-$2099 price range, making this a touch less expensive than Tempurpedic. Be warned, though — other Aireloom collections can get up to the $6,000 range. Tempurpedic is one of the most well-known bedding brands and is typically associated with being expensive, high-end, and luxurious. Its price is comparable to Aireloom, and depending on what Aireloom collection you’re looking at, might even be pricier. In general, Tempurpedic mattresses offer a pronounced degree of sinkage, good pressure relief, sharp contouring qualities, slower response times, and low degrees of motion transfer. Let’s move into a direct comparison! 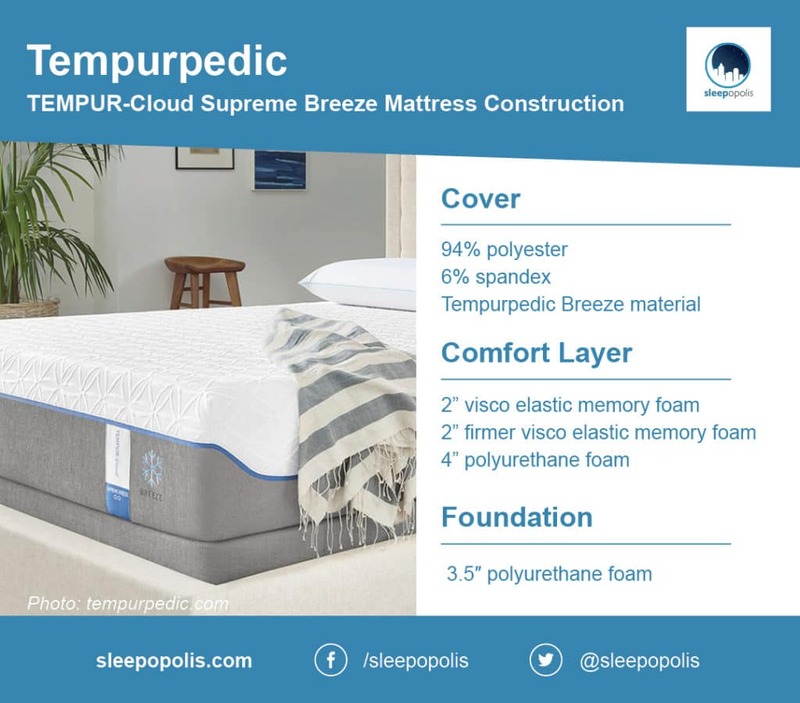 For today’s article, we’re going to focus on the TEMPUR-Cloud Supreme Breeze mattress, which is an all-foam mattress with four different layers. Let’s look inside. The cover of the TEMPUR-Cloud Supreme Breeze consists of a blend of polyester (94%) and spandex (6%), giving off the feeling of being both soft and flexible. The cover is made from Tempurpedic’s Breeze material and helps retain heat and keep the body cool. Now, onto the foam. The top layer is 2″ of visco elastic memory foam, which is a softer foam that provides a dynamic “hug” and contours well to the body. The next layer of foam is 2” of a firmer visco elastic memory foam that provides additional support. The next layer is four inches of polyurethane foam that acts as a transition layer before getting to the more supportive layers of foam found in the mattress foundation. This foundation layer is 3.5″ of polyurethane foam and provides a deep compression. As far as firmness levels go, the TEMPUR-Cloud provides a true medium-firm feel. This makes its comfort level pretty similar to the “luxury-firm” comfort level from the Aireloom Aspire. Along with the medium level of firmness is a decent amount of sinkage, so you’ll feel like you’re sleeping “in” the mattress instead of on it — a distinct difference between Aireloom’s Lift Technology. This might not be a great option for stomach sleepers who need a good amount of support for the hips and lower back, yet could be super for side sleepers who enjoy contouring pressure relief. Since there are no springs, there is minimal to no bounce on the TEMPUR-Cloud. That said, this mattress does a great job isolating motion transfer and keeping you undisturbed if you’re sleeping with a partner. Its all-foam construction dissipates interference across the surface of the bed and works to dampen motion throughout the entire mattress. Overall, this mattress will provide some great body contouring, a good level of sinkage, and will let sleepers enjoy supreme pressure relief. This is especially a good choice for side sleepers who will utilize the thick layers of memory foam to cradle the shoulders and hips and provide pressure points with ample support and relief. 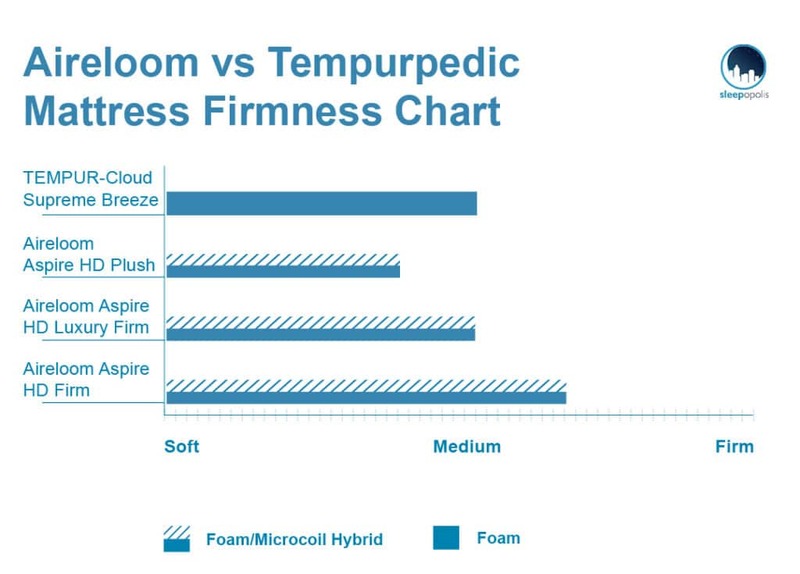 Foam core: Both the Aireloom Aspire Foam and the TEMPUR-Cloud Supreme Breeze are true foam mattresses. They each have thick foam cores, which provide that well-known contoured support while relieving pressure and making you feel cradled. Price: These mattresses are expensive. While we don’t know the exact price of the Aireloom mattresses, we do know that the TEMPUR-Cloud starts at $3,000. If you’re looking to invest in luxury, this is the place to do it. Motion control: If you sleep with a partner, either of these mattresses will keep you undisturbed all night long! Both mattresses do a great job at isolating motion, something foam cores tend to do quite well. Luxury: If you’re looking for luxury and really want to invest in a mattress, Aireloom and Tempurpedic are both great choices. They use high-end materials, quality foams, and intricate design and manufacturing techniques. Comfort layer: Yes, both these mattresses are truly “foam-forward,” but they do differ when it comes to comfort layer. The Aireloom has different types of foam in the comfort layer, including memory foam, and also has a bottom layer of micro coils. The comfort layer for the TEMPUR-cloud is all foam, with a deep focus on memory foam. 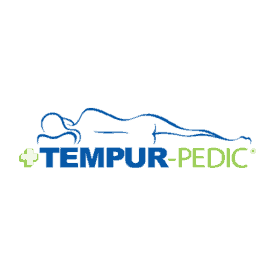 Sleep position: The TEMPUR-cloud is a great option for side sleepers who enjoy pressure relief and love the feeling of sinking into the mattress. The Aspire HD Foam is great for all sleep positions since you can choose between the plush, luxury-firm, or firm options. Sinkage: Aireloom’s “lift” feature will make you feel like you’re sleeping on top of the bed, even with the foam core. On the flip side, TEMPUR-cloud will provide a good sinkage feeling, putting more of an emphasis on sinkage and cradling. How to buy: You can only purchase an Aireloom mattress at a retail store. For Tempurpedic, you can either buy online or in-person. If you’re looking for a luxury foam mattress, both of these beds are great options. 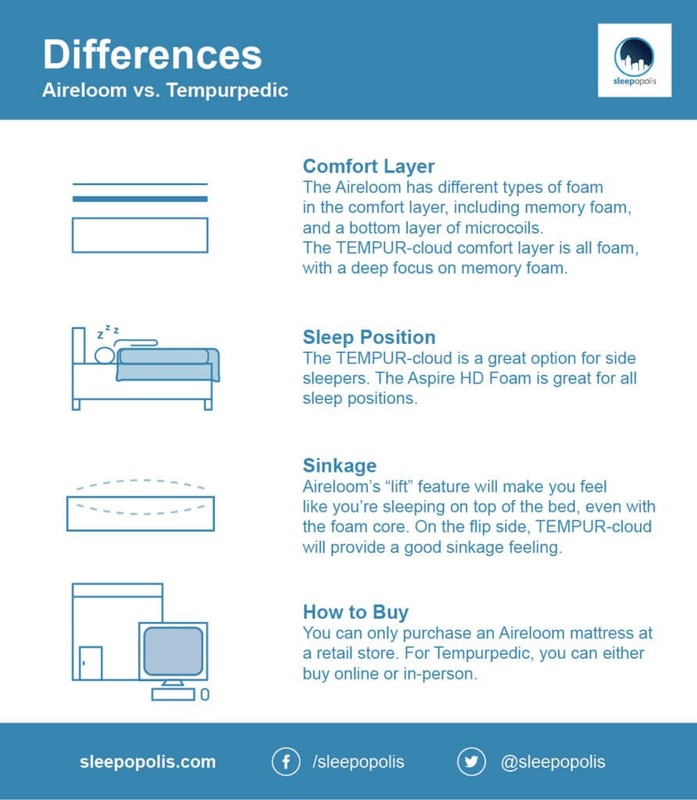 However, when it comes to Aireloom vs Tempurpedic, they have just enough differences so you know which is a better fit for the bedroom. If you want a hybrid mattress for all sleep positions that provides a good “lift” off the mattress, then Aireloom is the way to go. If you’re looking for a classic memory foam feel, sinkage, and medium-firmness, Tempurpedic might be calling your name.